Termtime only on Thursday mornings at Iwade Barn 9.30am get in touch to check dates. Iwade HealthWalks have been running for some years and meet outside Iwade Pharmacy. Led by James Apps and administrated by Steff, the walks last 60-90 minutes and tend to be across rough ground so do wear suitable footwear. Be aware that you may come across farm animals and dogs. No charge and all welcome, although unfortunately not dogs. Crochet and Natter meet at All Saint's Church. Everyone is welcome and there is no pressure to stay for the full 2 hours or go every week. You can even go along if you don't crochet for a natter! Contact Maria if you would like to know more! Normally every Monday evening 7pm-8pm at Iwade Barn. Normally every Tuesday evening at Iwade Barn, 6.30pm for Antenatal Yoga and 7.30pm for Yoga for All with Hayley Clinton, Hayley's Bloom Yoga. Prebooking essential, get in touch to book your place, limited places due to the size of the barn. Election of councillors to Swale Borough Council Bobbing, Iwade and Lower Halstow Ward at Iwade Village Hall. Keep an eye on the News on the home page to find out who you can vote for. Are you looking for a family night out that won't break the bank? 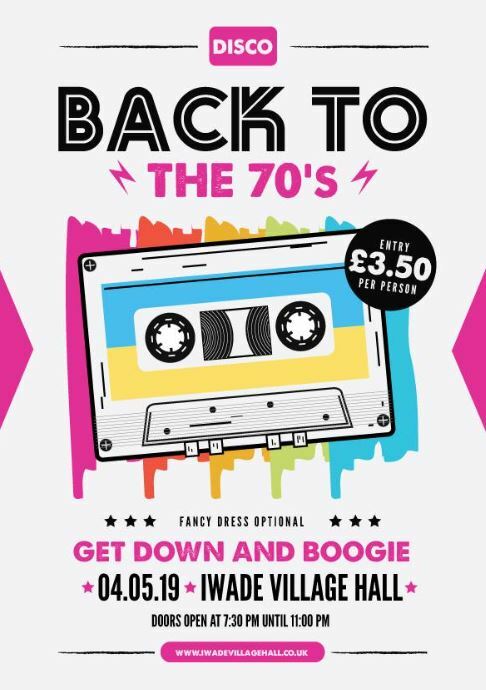 Come down to our 70s disco on Sat 4th May - it's just £3.50 entry and it's bring your own food and drink, so no worrying if you'll get your favourite tipple or if your childrens favourite crisps are on sale - just bring it yourself! Sure to be a great night out for the whole family - fancy dress is optional! At Iwade Barn, Iwade Men's Breakfast Club always have bacon butties and coffee or tea and often have a speaker, all welcome. Activities, information and support for those caring for a person living with dementia, if you're worried about someone's memory or if you just want to meet other people affected by dementia. 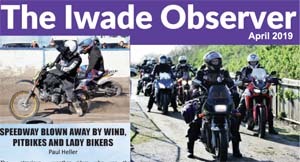 Once a month at Iwade Barn. 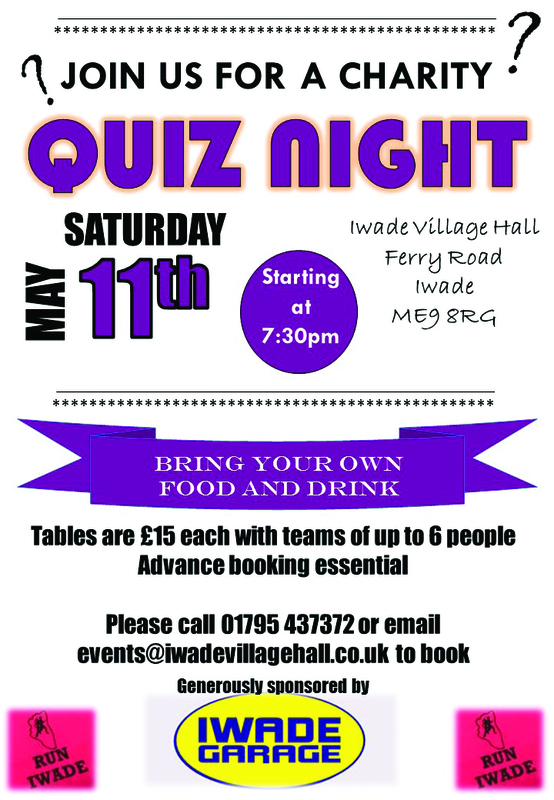 At Iwade Village Hall tables are £15 each with teams of up to 6 people. Advance booking essential. Call 01795 437372 or email events@iwadevillagehall.co.uk to book. Generously sponsored by Iwade Garage. 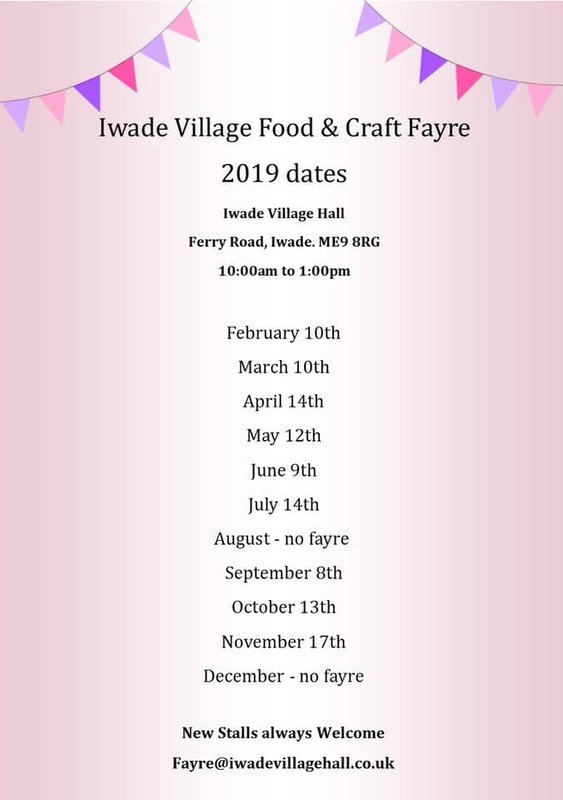 Iwade Village Food and Craft Fayre is at Iwade Village Hall with a great range of stalls and refreshments in the kitchen. Note there will not be a Fayre in August or December. Iwade Reading and Book Group get together at Iwade Barn. Everyone most welcome so why not come along. This month's special feature is Resolutions. This month's special feature is Macknade Foods. This month's special feature is Cartoon Drawing! This month's special feature is a 2 hour Felt Flower Workshop! This month's special feature is the annual Harvest Supper. This month's special feature is Craft - Stone Decorating. This month's meeting is the AGM. This month's meeting is the Christmas Meal for Members only.